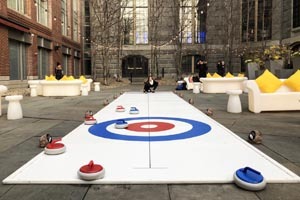 Originated in 16th century Scotland, curling is enjoying a renaissance after the most recent Olympic Games, and The Liberty Hotel has built an iceless outdoor rink and will be open to the public on November 12, where curling fans and novices alike can try their hand at the sport. Two or four players can play at a time and rounds usually last around 30 minutes. Players can enjoy the game with eight synthetic stones, which are smaller and lighter than traditional granite stones. Complimentary curling will be offered with the help of “curling concierge” on Mondays and Wednesdays (November – February) from 4pm – 8pm, weather permitting and reservations are suggested. The curling rink is also available for use outside of the “curling concierge”-staffed days, for those who would like to curl on their own. In addition to the fun curling activity, guests can enjoy an “après-curling” menu created by CLINK. Executive Chef Daniel Kenney (options include: Shishito Pepper Tempura with Spicy Kewpie Mayo; and Heritage Pork Meatball with Roasted Tomato Sugo, Polenta and Grana Padano) paired with a “winter warmer cocktail” menu featuring creative curling-themed drinks such as The Bonspiel (New England hot mulled cider steeped with baking spices); and The Stone’s Throw (bourbon, Amontillado Sherry, Carpano Antico Formula, black walnut syrup, and Angostura bitters). Complimentary curling will be offered on Mondays and Wednesdays (November – February) from 4pm - 8pm, weather permitting. Walk in are welcome and reservations can be booked via clink@libertyhotel.com or 617-224-4004. The event is part of the hotel's Liberty Affairs programming, a series of complimentary events throughout the week for both hotel guests and the local community alike.